Are you wondering what to do about your home if a family member needs care due to aging or disability? Most elders and persons with disabilities do not have good long term care (LTC) insurance policies to provide adequate funds to pay for the care they need at home, in an assisted living facility, or in a nursing home. The ones who do have long term care policies are most often underinsured. For those who have no LTC insurance yet, their applications will be denied if they already have even one of scores of medical conditions. With our elders and family members with disabilities living well into their 80’s, 90’s, or even over 100, we are at a loss when a loved one starts to need custodial care, i.e. assistance with their activities of daily living–transferring, toileting, incontinence supplies, bathing, dressing, feeding, or supervision due to cognitive impairment. We learn that an assisted living facility will cost thousands of dollars per month and that a skilled nursing facility in Santa Barbara will cost even more, around $7,500 and up, unless Medicare, Medi-Cal, or a Veterans Administration Aid and Attendance Pension will help defer the cost. So what are these public benefits programs? Medicare is a universal health insurance for U.S. citizens and permanent residents who are 65 or over, blind, or disabled and have earned enough quarters of work paying into Social Security. The monthly premiums for Medicare A and B are deducted out of the Social Security check. Medicare A pays for hospital care and skilled nursing facility rehabilitation care only. Medicare A is not a long term care program and does not pay for any custodial care apart from rehabilitation care, which usually ends about 3 weeks after discharge from a hospital to a skilled nursing facility. Custodial care is 90 percent of the care given in a nursing home, but if that is all you need, then Medicare does not care enough. Medicare A also will not pay for any nursing home care at all if the patient did not spend three overnights in the hospital within the 30 days prior to the admission to a skilled nursing facility for rehab care. Medicare A co-payments after day 20 of rehab services are around $4,000 per month. Medicare B pays for outpatient care, doctors, lab fees, and durable medical equipment. Medicare C, or Medicare Supplement insurance, picks up all or part of the Medicare co-payments and deductibles. It is optional and you pay extra premiums for this kind of insurance sold by a myriad of private companies. Medicare D is partial prescription drug coverage sold by private insurance companies. The hated “donut hole” of no Rx-coverage was a boon to the insurance industry, as was the privatization of the plans in the first place. Medi-Cal is a needs-based public benefits program for persons who are 65 or over, blind, or disabled, and it does pay for purely custodial care on a long term basis, as well as picking up the co-pays on Medicare rehab coverage. (There are also Medi-Cal benefits for families with dependent children, not discussed here.) One must qualify for Medi-Cal based on a certain level of countable assets, and the co-pay will be determined by income. Medi-Cal while one is not in a skilled nursing facility is both a poverty program and a middle-class program because even retirement accounts, a home, and a car of any value are not countable assets and therefore will not keep you from getting Medi-Cal. 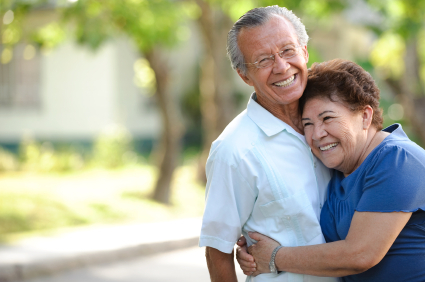 When one spouse is in a skilled nursing facility and the other is not, Medi-Cal is a solidly middle-class program because there are special anti-impoverishment provisions that permit the non-institutionalized spouse to retain up to all of the assets and still qualify the other spouse for LTC Medi-Cal for nursing home care, depending on the situation. Because of the exceptionally low interest rates now, a couple might be able to retain over $1 million in countable assets and still qualify the ill spouse for LTC Medi-Cal if appropriate legal measures are taken. The Veterans’ Aid and Attendance pension is a tax-free pension for U.S. vets who served even one day during a war and 90 days of total service, and who were not dishonorably discharged. It does not require an injury during the war or war-zone duty. This pension is available to such vets who are 65 or over or disabled, and whose household income is whittled down to less than about $1,000 (if care is not needed) or to less than about $1,900 per month (if care is needed) due to unreimbursed medical expenses, including custodial care for the vet or the spouse in any environment. The maximum pension is $1,949 per month for a married vet, or $1,056 for a widowed spouse of a vet who would have qualified if living. Even $1 of pension entitles the vet to VA Health Benefits, such as free prescription drugs by mail. There are asset limitations based on the life expectancy of the applicant in order to qualify for these pensions. Seniors are particularly at risk for unnecessary annuity sales to qualify for VA pensions. They are targeted by insurance agents who are not accredited by the VA to be claims agents. Some professionals or non-professionals even charge for assisting with the application, even though it is a violation of federal law for any person, even a VA-accredited attorney or claims agent, to charge any fee to any applicant or interested party to assist with a VA application. It is also unlawful for a facility to pay anybody to do their residents’ applications because the facility is considered an interested party. As we ponder the predicament of a need for care and the confusing nature of these programs that can assist in paying for benefits, we ask our neighbors what they know about these programs. We try to find the answers on the internet. We go to free lectures to learn what to do. We get bamboozled and purchase an annuity based on the mistaken concept (gleaned from the internet or conveyed to us by the insurance agent in order to make the sale and earn the commission) that an annuity is the only way or the best way to qualify for a VA pension or Medi-Cal. Or sadly, we encumber the home with a reverse mortgage to pay for home care or we sell the home to pay for a nursing home on a private pay basis. Perhaps we get Medi-Cal and then get a notice that the home will be subject to a Medi-Cal estate recovery claim after the death of the beneficiary, so we hastily give the home away to our children and they lose the step-up in capital gains tax basis after our death, or we put their names on the deed as joint tenants and they face a lien by the State after the beneficiary dies. The good news is that these “public benefit programs” for seniors and for persons with disabilities look kindly upon home ownership. To put it simply, you can own a home of any value if it is your primary residence or if your spouse or your minor or disabled child lives in the home, and this home ownership will not prevent you from getting Medicare, Medi-Cal, or a Veterans Administration Aid and Attendance Pension. Furthermore, if you no longer live in your primary home because you are in a care facility and if you check off the right box on the Medi-Cal application, this home will not keep you from qualifying for Medi-Cal. If you decide to rent your primary home out, the net income will affect your co-pay for Medi-Cal, but even this is fixable in certain situations. Although unintended negative consequences can come from giving away real property, these can be prevented if appropriate legal steps are taken in advance and if inappropriate transactions are not completed at all. I often see adult children or the elderly client in my office after a major transaction has been completed when the clients or their family were shocked to hear through the grapevine that “you will lose your home if you get Medi-Cal.” The second half of this half-truth is that this loss is a lawfully avoidable problem. You can give away a home without any impact on Medi-Cal, but only if it is done according to the Medi-Cal regulations. The biggest unseen danger in giving away a home during the owner’s life to prevent a Medi-Cal estate recovery claim after death is the risk of negative consequences for property tax, gift tax, estate tax, and/ or capital gains tax purposes. Rest assured that there are legally sophisticated ways to protect the home from a Medi-Cal estate recovery claim while avoiding these negative consequences. Another strategy that can be ill-advised is to get a reverse mortgage when one or both of the owners need care in the home. Most elders decide to get a reverse mortgage because they want to stay at home and be cared for there. Unfortunately reverse mortgages and reverse equity loans can have major negative impacts on Medi-Cal eligibility or on VA pensions. More importantly, these high-cost loans deplete the estate for the sake of paying for some private care when other alternatives were available. Most people who already need care at home now will predictably need more care than can be afforded at home much sooner than expected. Generally the reverse mortgages do not pay enough to provide for 40 hours per week of care. So once the borrowers need that much care and move out of the home into a more affordable assisted living facility (or more likely a skilled nursing facility) to accommodate the increase in their care needs, then the reverse mortgage loan will be called due in about a year. (Read the contract!) This means that the home will have to be sold to pay off the reverse mortgage or the reverse equity loan. Whatever part of the proceeds the owners get can disqualify them from Medi-Cal benefits, and they may end up having to spend it on $7,500 per month of private pay bills for a nursing home before qualifying for Medi-Cal, depending on what the regulations say at the time of the sale and the nursing home entry. The best strategy is to find out your legal options and strategies before taking any drastic steps with your home if you want to qualify for elder care benefits or to protect the estate afterwards for the heirs. With appropriate guidance, you can sometimes have your cake and eat it, too.